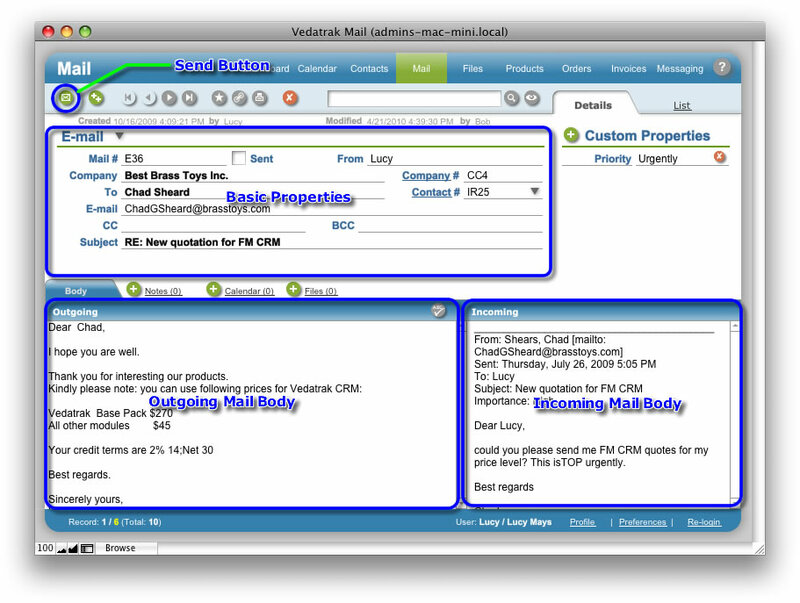 Mail Detail View is used to compose a message and edit mail properties. Use the Type drop down list to specify the message type (E-mail, Fax or Letter). The Sent check box indicates the sent status of the message and is automatically checked after an e-mail is sent. The From field automatically contains the Our Rep name for the associated contact upon creation. The Company and Company # fields automatically display the recipient's company Name and Contact # upon message creation. If the recipient is an Associated Contact (for example Staff), the fields display the Parent Contact name and contact #. The To and Contact # fields that display the recipient contact's Name and Contact # are generated automatically upon message creation. They can be changed by selecting a different contact from the Contact # drop down list (for example, another staff member in the Company). The E-mail/Fax/Address field (depending on message Type) is generated automatically upon message creation as recipient contact's E-mail, Fax or Address. Specify the additional addresses in the CC and BCC field if necessary. Manually Input the Subject of the message. Compose your message in the Outgoing field. Click Spell Check to check your message before it is sent. Users may copy and paste the incoming message to the Incoming field if necessary to view it while writing. Use the Send Button to send a prepared e-mail. The Sent check box checks automatically when a message is sent.